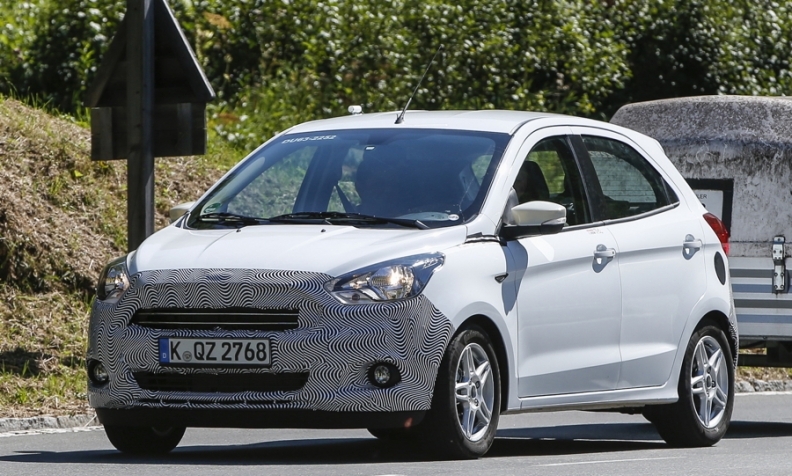 Ford is adapting for Europe the latest-generation Ka, seen here during road tests. BARCELONA – Ford Motor will definitely replace its Ka minicar in Europe, a senior executive said. Production of the current Ka is set to end in April at Fiat's plant in Tychy, Poland. The Ka sold in Europe is based on the Fiat 500, which is also built in Tychy. The model's new generation was developed in Brazil and is based on Ford’s global B platform that underpins the Fiesta subcompact. It was expected to launch in Europe by the end of last year. Ford of Europe Chief Operating Officer Barb Samardzich wouldn’t give information on the timing of the new Ka’s launch. "It's coming, I can say that," she said on the sidelines of the Mobile World Congress tech event here. Samardzich also wouldn't comment on reports that Ford will add production of the Ka and the EcoSport subcompact SUV at the automaker’s factory in Craiova, Romania, where the slow-selling B-Max subcompact minivan is built. The EcoSport is imported into Europe from India, where Ford also builds the Brazilian-developed Ka under the Figo name. The new Ka is expected to be larger than the current model sold in Europe, Ford has said it has made "significant" enhancements to adapt the Brazilian-developed Ka for European markets. Samardzich also declined comment on reports that the company will ax the B-Max. But she said Ford plans to concentrate on selling models in fast-growing segments such as SUV/crossovers. Ford is launching five upgraded or new SUV/crossovers in Europe in the next three years, including the Edge large SUV and a face-lifted Kuga compact model, both of which are due this year. Ford sold 48,603 Ka models in Europe last year, down 8.2 percent, according to figures from JATO Dynamics market analysts, making it the No. 12 seller in a segment whose volume grew by 7.5 percent to 1.2 million. The top-selling model was the Fiat 500, followed by the Fiat Panda, VW Up and Renault Twingo. European sales of the B-Max fell 14 percent to 46,315 in 2015. Ford of Europe's announcement on Feb. 3 that the company is refocusing its product strategy in the region to improve profitability raised doubts that it would replace the Ka in the low-margin minicar segment. Ford aims for a 6 percent to 8 percent operating margin in the long term in Europe, up from 0.9 percent last year.